Unless you spent the week under a rock, you already know the big news last week came straight from Apple’s keynote. 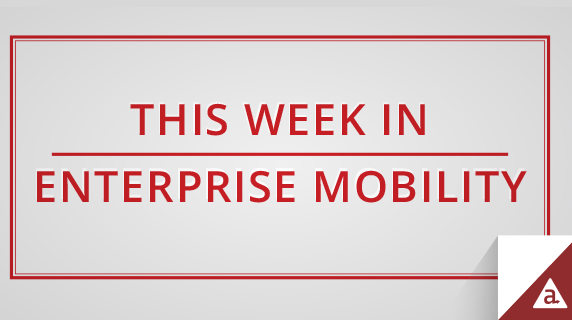 Below, what it means for enterprise mobility (and a little news from Twitter, too). It’s not getting as much buzz as the new iPhone 6 or Apple Watch, but as you’ll see in our Takeaways blog post, we argue that Apple Pay could well be the most disruptive of all the new announcements. Don’t believe us? Cade Metz over at Wired argues that this implementation of Apple Pay will finally destroy the online-offline shopping divide, changing the way we pay by simplifying purchases not just in the real world but online and via apps. A one-touch payment button may finally offer the level of simplicity needed for mobile shopping to become far more mainstream than it currently is. Developers should pay attention, as there will be many opportunities to incorporate simplified app purchases and increase revenue by giving users a better payment experience through their smartphones. Today’s poor user experience of shopping from our phones — and the difficulty of moving seamlessly from online browsing to offline purchasing and vice versa — will no longer prove the barrier it has been for so long. Enterprises large and small should be looking for ways to better connect with their customers using Apple Pay’s new tools. As expected, Apple announced two new smartphones this time around – the iPhone 6, clocking in at 4.7 inches, and the 6 Plus, which reaches 5.5 inches. The increase in screen size comes in response to the success of several Android phones that dwarfed the previous iPhones (well, relatively speaking). Reversing a long trend toward shrinking handsets, Apple put its stake in the ground with two larger screens. For people looking to use their phones as a primary or close secondary work device, this — combined with the higher resolution of the new devices — is great news. The rest of the hardware includes upgrades in battery life, processing speed, camera quality and more. These specs have many developers — consumer and enterprise alike — salivating at the possibilities. A note on BYOD: Jordan Golson wrote a post over on TechRupublic warning IT departments that they’ll be seeing Apple Watches in offices soon, whether they like it or not. And if you can’t beat ‘em… Well, the truth is that the Apple Watch has tons of potential for enterprise use cases. More than just allowing the watch to operate within an enterprise environment, developers and IT should take this new type of user interface and dream up work solutions that people will actually want to use, ranging from well-timed yet discreet notifications to simple on-the-go reminders for remote, or field service workers. It’s more than just a smaller screen — it’s a fresh form factor with tons of possibility around new use cases and scenarios. The newest Apple mobile operating system, iOS 8, comes equipped with new security features, productivity enhancements and more device management options. Enterprises should begin to feel more comfortable supporting BYOD devices as iPhone users upgrade to iOS 8, which will give them more data protection options for apps and better control over email encryption. IT departments will also be able to more carefully manage information flows with MDM tools that allow documents to be shared for a limited period of time, for example. They’ll also be able to control which apps can download and access enterprise grade docs, as well as develop custom content-filtering tools. Additionally, the new OS should prove enticing for enterprise developers who will find a range of new productivity tools to play with. Wondering how all these updates will affect your work with Appcelerator? Check out our blog post for more details. Of course, Apple didn’t have a complete monopoly on mobility news last week. In fact, Twitter made a bold move by announcing a new annual conference for mobile developers, called Flight. The first one will be held on October 22 in San Francisco. After a rocky relationship with developers that included the company repealing its API access for third-party apps, Twitter is now looking to smooth things over. Twitter also launched a new developer site, on which it promises better experiences for developers, in part thanks to its acquisition of startups including Crashlytics, Mopub and Gnip, which provide developers with tools for testing and performance, monetization and more robust data connections. Although Twitter’s user base is significantly smaller than Facebook’s, 271 million monthly active users is nothing to sneeze at, especially given just how active and engaged those users can be — and the influence the tool has in the larger online community. What does your company plan to do with Apple’s new devices, iOS 8 and Apple Pay? Is your company looking for development opportunities with Twitter? Tell us in the comments!